Many people see weightlifting as something simply for younger individuals, particularly men. They see it as something that athletes do to become stronger and to increase endurance. What many do not know is that weightlifting and other forms of strength training can be just as helpful to senior citizens as they are to younger adults. In fact, the benefits of weight lifting for seniors go far beyond increased muscles mass and strength. In general, weightlifting does increase physical endurance, making other physical activities easier for seniors and helping them to live independently for a longer time. Additionally, this form of exercise provides numerous other health benefits that can be particularly important to senior citizens. These benefits are both physical and mental. Seniors often begin to find that they have a harder time keeping their balance as they grow older. The sense of balance is rooted in the ear canal. As the ear ages, balance may become more difficult, however, balance is also tied to the health of the muscles. Stronger legs and a stronger core make it easier for a person to stand up straight and maintain good balance. In addition, improved balance decrease the chance of falls and broken bones. Over the past several years, people have become more educated on how weightlifting is directly tied to the health of the bones. Seniors, in particular, worry about their bone health because the bones lose tissue and become less dense as one ages. This is especially true for women after menopause but strength training increases bone tissue. The United States’ Centers for Disease Control and Prevention, cite a study performed at Tufts University that demonstrated how strength training could decrease both osteoarthritis and rheumatoid arthritis pain in seniors. In fact, the decrease in pain after strength training was found to be quite similar to the decrease in pain when taking medication. Seniors who have struggled with the debilitating effects of arthritis know the thrill of waking up in the morning with less pain in their joints. Many senior citizens struggle with type 1 or type 2 diabetes. These diseases prevent the body from correctly processing sugar, or glucose. Insulin, produced in the pancreas, is the necessary hormone for regulating blood sugar. Seniors who lift weights regularly find that their blood sugars become more controlled and that they feel better in general because insulin is produced more regularly. The heart is one of the most important organs in the body. It is what is responsible for pumping the blood throughout the body’s organs and tissues. As a person ages, the heart may become weak through a variety of disease processes such as congestive heart failure or arteriosclerosis in which the arteries of the heart become blocked. Regular strength training can improve heart health by decreasing blood pressure and thereby decreasing the workload of this vital organ. Not only does weightlifting increase bone strength, but it also increases muscle strength. Some may worry that weightlifting will add a great deal of bulk to their frame but this is usually not the case since muscle tissue is leaner than fat tissue. A moderate amount of weightlifting sculpts the body, creating a slim look. People are becoming increasingly aware of the effects of all forms of exercise, including weightlifting, on mood. As the muscles are worked and oxygen-rich blood is pumped throughout the body, the brain releases hormones that are known as the “feel-good” hormones of the body. These hormones include dopamine, serotonin and endorphins which improves one’s mood. In fact, those who exercise in the morning find that they are generally happier throughout the day. Weightlifting is certainly not a form of exercise reserved solely for young adults. Under a doctor’s supervision, seniors will find that they acquire numerous health benefits from this type of strength training, not only for their bodies but their minds will become healthier as well. Jennifer Anderson is a frequent contributor for Assisted Living Today. She writes on a wide variety of topics including technology, health, green living and entertainment. Top Ten Benefits of Running (Infographic)! 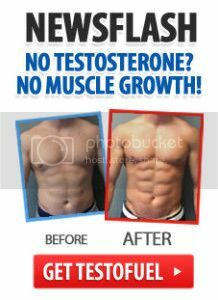 How Muscle Building Offers Fitness Fanatics Huge Benefits!